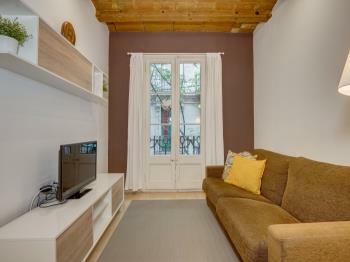 This apartment recently renovated (HUTB-001043) is ideally located next to the Sagrada Familia in a quiet semi-pedestrian street. It has one double bedroom with an ensuite bathroom with shower. You will find a hairdryer and some amenities to make your arrival more comfortable. 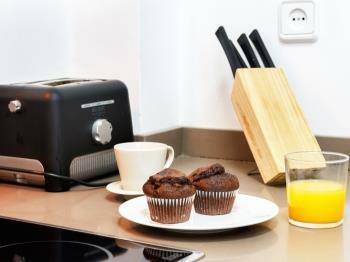 The kitchen is totally equipped with modern household appliances and small appliances. You will be able to prepare your own food or to warm an already made one. 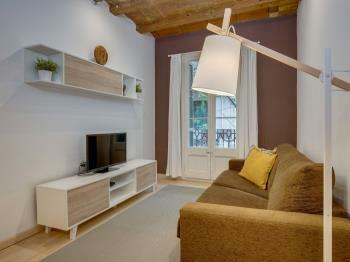 On the living room, you will find a round table with chairs and a spacious sofa-bed and a big wardrobe. 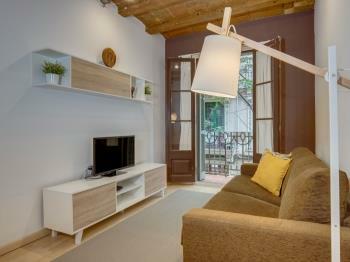 There is a TV, a DVD and WiFi conexion. This room has natural light because it has a balcony that faces the street. The building has a classic look, well-kept and does not have elevator. The apartment is on the first floor. Other residents are living in the building, so parties and noises at night are totally forbidden. 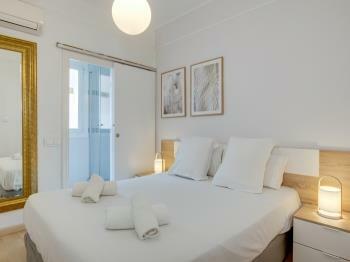 Cozy one bedroom apartment with ensuite bathroom, ideal for couples or families with small children (HUTB-001043). 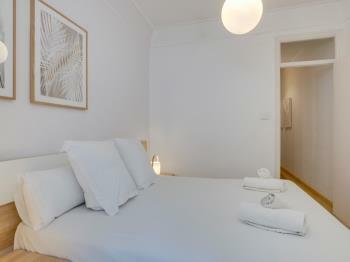 The room has a double bed and a recently renovated bathroom with shower. There is hair dryer. The stay is very quiet because it overlooks an inner courtyard of neighbors. 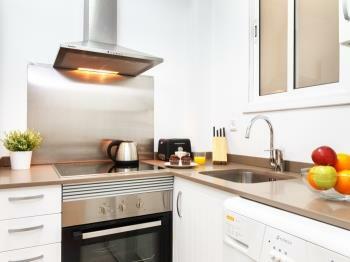 The kitchen is fully equipped with modern appliances so you can cook or heat meals comfortably. In the living room there is a large wardrobe where you can store your belongings, a round table with chairs and a large sofa bed. There is TV, DVD and internet connection. A balcony overlooking the street brings to this room natural light. 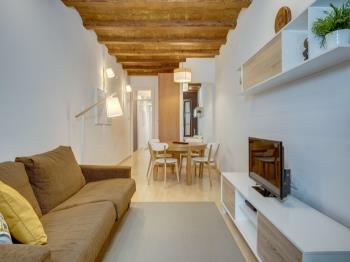 The bulding has been recently renovated and the apartment is on the first floor. There is no elevator. In the building live other neighbors, please respect your rest. A member of our staff will meet you at the apartment on your arrival day. 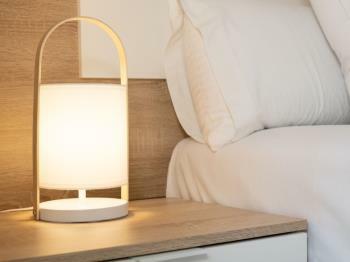 During your stay, there will be a 24-hour telephone service. You can also send us an e-mail or call us if you need to resolve doubts about the planning of your trip. The neighborhood is very family friendly, there are parks and pedestrian zones and it is full of shops, supermarkets, cafes and restaurants. There is a supermarket and a market 5 minutes from the apartment. The most emblematic of the neighborhood is the Temple Expiatory of the Sagrada Familia, a magnificent work of Gaudí of impressive size still under construction. You can enjoy the incredible views of this monument located just 2 minutes walking from the apartment. Next to the apartment there is a metro stop where you can take 2 lines: the blue and the purple (L2 and L5). In addition there many public bus lines and a stop where you can take the Tourist Bus, just 200 meters from the apartment. Barcelona is a fairly flat city, so you can easily walk to many of the sites of interest in the city or ride a bike. 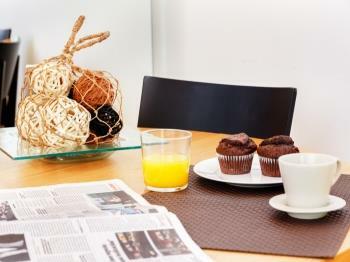 Fully equipped double bedroom apartment perfect for couples or families with small children. 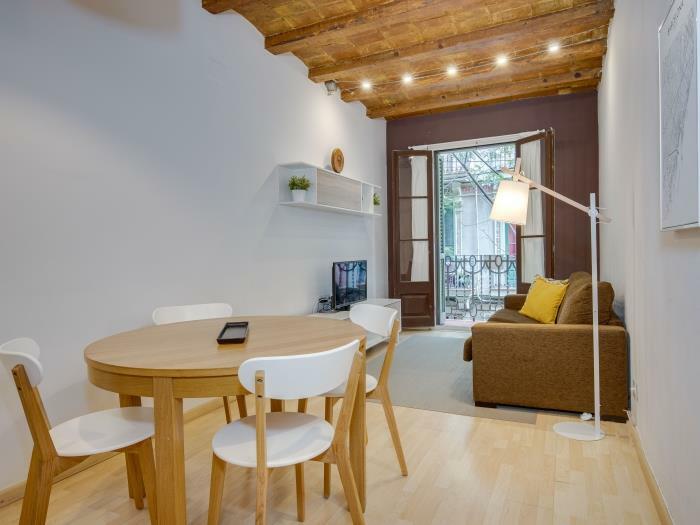 The apartment is located in a charming classic bulding and has been recently refurbished to adapt to the needs of the present times. It is a first floor without elevator. The room has a double bed and an ensuite bathroom with shower where you will find a hairdryer and some basic amenities make your arrival more comfortable. This is the only bathroom in the apartment. It overlooks an inner courtyard of neighbors so this stay is very quiet. The kitchen is fully equipped with modern appliances and utensils to allow you to make or heat dishes. The dining room and living room of this apartment has a large closet where you can store your belongings, a practical round table with chairs and a large sofa that converts to a double bed. There is TV, DVD and internet connection. On the balcony comes natural light as this room faces the street. 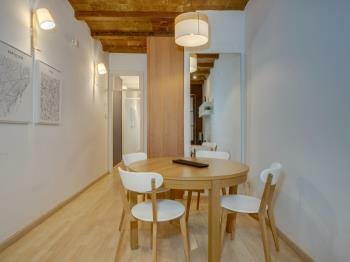 It is located in a very quiet semi-pedestrian street, 2 minutes walk from the Expiatory Temple of the Sagrada Familia. In the area there are many shops, bars and restaurants, as well as walks, parks and terraces.